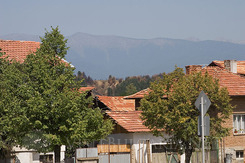 Location: The village of Banya is situated in the south-west of Bulgaria, in a valley between the three big mountains Rila, Pirin and the Rhodopes. 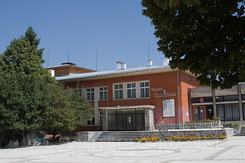 It is 156 km away from the capital Sofia and only 4 km to the east of the town of Razlog , and at about the same distance to the north of the ski centre and mountain resort of Bansko. The population of the resort is 3,000. History: The mineral springs in the site are the reason this region to be settled very early. The first inhabitants are the Thracians, which is proved by the remains of their culture around the old bath and outside the village dated back about IV century BC. In II century BC the region was conquered by Philip II, the king of the Macedonian tribes. A temple of Apollo (as a god of health) was built then in the village. During the III century BC in the region came Celts, and remained to live together with the Thracians. With the expansion of the Roman Empire during the I century BC the valley of Rila, Pirin and Rhodopes was joined to it. Traditional Rome thermals that can be seen even today, were built in the village. As the Empire was Christian already, the old temple of Apollo was destroyed and replaced by the “Holy Virgin” church (II century). After the breaking up of the Roman Empire (IV century), the village became a part of the Byzantium Empire. Very soon the Slavs came, but all tribes continued to live separately in peace. In IX century the region became a part of the Bulgarian state. 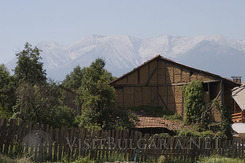 Sightseeing: There are several archeological sites in the village and its surroundings because of Banya’s long history. The old Roman thermals, which are about to be renovated, and “St. George” church are announced monuments of culture. The tradition of local crafts as iconography, wood-carving, loom and embroidery is still alive. In the village there are two warm mineral pools – one Olympic-size swimming pool and one for children. 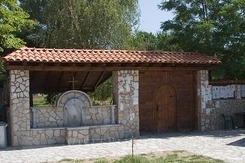 Mineral water: The mineral springs of Banya are 72, situated in the village and at the foot of the height Zhensko bardo. The total capacity of the springs is about 76 l/s. Water temperature is between 37-57oC. The water is clean, scentless and without a precipitate, good for drinking. It contains of hydro-carbonate, sulephate, sodium, fluorine and silicon and is weakly mineralized. It is used for medical treatment of chronic inflammatory diseases of the locomotory system, chronic gynecological diseases and inflammatory diseases of the nervous system. There are also mud-curing deposits. Tourism: Banya is currently undergoing massive development into a spa and wellness resort with plenty of new hotels, restaurants and other tourist facilities emerging each season. Its closeness of Bansko is the reason Banya to be preferred by the ski lovers. At the same time it preserves its traditional village style and is perfect not only for winter but for summer tourism, too.